I would have never known the existence of this old “Dance Hall” if it were not for a few acquaintances I made with some kind Texan folk when researching histories of other local abandoned buildings. The “Dance Hall” is about 100 years old and according to the owners it has been relocated at least three times in the past century over the distance of several miles. It was originally built near Rock Quarry by the railroad tracks and over the years it has been used as a place of residence, a Dance Hall for the local community and currently used to store hay and other farm related materials. The original structure is simple in design and stubbornly holding together. When I asked if I could go inside I was told to be careful, not because of weak floorboards but of possible snakes. It wouldn’t be the first time I came across snakes while exploring rural decay and thankfully this time was not one of them. It was creepy inside with the wind blowing across the metal roof and through the gaps in the wall. My imagination was stirring as I stepped inside and saw the walls buckling out. I tried to envision rowdy dances, like the ones you see in old Western films, held inside; but it was a stretch. I am pretty sure by now any wild dancing would cause the floor to give out. Avenue P is a narrow residential dirt road on the edge of Anson, a small central Texan town famous for being the inspiration for the Kevin Bacon film Foot Loose. Not the place one would expect to find such playful and quirky architecture, but it was on this unsuspecting road where I found what felt to me to be the most whimsical rural house I have ever seen. From the main road I could see the broken windows and bare wooden walls peeking through evergreens and winter trees. It beckoned to my curious nature and an immediate U-turn was performed. From the front of the house you see a foundation for typical Texan house with a low roofline and a small porch entrance, similar to every other family home on the road; however, even from this vantage point you see elements of the creative spirit who once dwelled here. It was these creative visual elements along with the over growth of trees that set this house apart from the rest of the houses on the road and gives it its whimsical almost fairytale like quality. The small porch reflected a Neo Classical inspiration with its squared columns and a simple pediment with arch opening over the doorway. The door was boarded up and windows were covered thoroughly with large sheets of corrugated metal. Looking closer you can notice more simple decorative details under the concealment of the wood and metal. Walking around the house and passed the trees into the parking lot next door I was able to get a full view of the back. An addition was added to the original simple Texan home and it revealed even more whimsy than the elements added to the front. Most of the windows were still covered, but I could see and admire small Mondrian styled stain glass accent windows. I was pleased that these windows were not damaged like many other windows from the numerous other abandoned houses I have come across. My hope is that others didn’t have the heart to break a beautiful decorative element like these. They are simple in pattern and color, but they offer a visual texture that completes the house. Even more noticeable than the small stain glass windows, was the odd structure of what I assume is a semi enclosed balcony. While standing directly behind the house and looking at the design of the balcony with the lines and form of the house you can see this odd plural marriage of Mondrian patterns, classical elements and modern architecture. I never found a way inside because the house was well boarded up and there was a large colony of wasps swarming out of a crack where the original and newer addition meets. When winter comes back, and the wasps are mellow, I hope to be able to find the current owner and gain access for interior photographs. I also hope to learn more about this Texan Gem. Why anyone would leave abandoned this creative oasis is a tragic mystery to me. I came across this wonderful example of a prewar high school building several years ago; it wasn’t until recently that I managed to locate the owners and gain access inside. Several times I had tried to learn the identity of the owners through online searches and a visit to city hall, but had no luck. Finally I decided to stop and talk to the locals in town, and eventually one person lead me to another who lead me to another until I found someone who knew the answer to my quest. I was given all the information I needed and kindly informed that similar requests had been made before but not granted. After leaving my business card with a member of the owner’s family and playing short game of phone tag with the owner, I found myself on the in. The owner liked the work he saw on my website and agreed to let me inside under the condition that I do not reveal the location of the building and kindly share with the owner some copies of the photos; as he is planning to renovate the building soon and would love to have a documentation of what it was like prior to renovation. Conditions were fair enough for me. I would have given him copies anyway, as it is only a fair exchange for his generosity. Plans were made to meet outside a week later and the owners gave me a lovely tour of the building prior to my photo shoot. 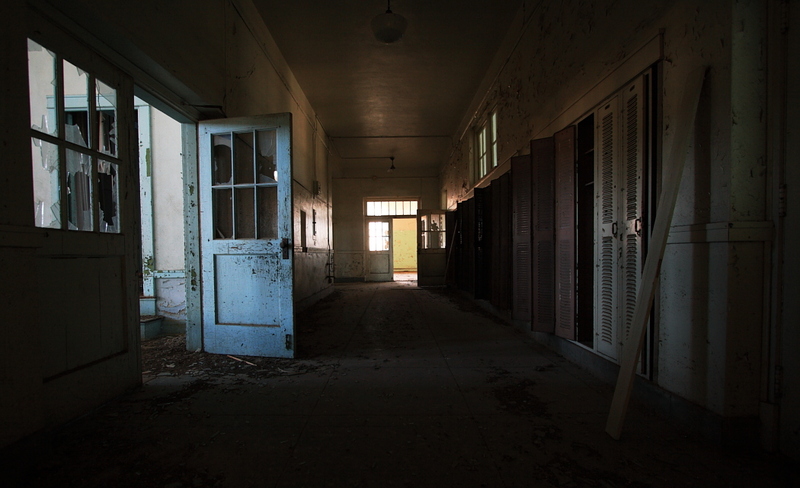 The high school was a large building constructed in 1922 and originally served only the local town population until eventually it served as the main high school for the entire county until it closed its doors in the mid 1970’s. At that time the high school students were relocated to the newer high school building, built to accommodate the growing population, and the original high school building was converted into a middle school for the next 15 years. The building has been empty since maybe 1989 and the gymnasium, built in the back in 1952, was used until the mid 1990’s. In the school’s early years a small open room in the school’s basement served as the only space sanctioned in the surrounding Baptist County for social dances. It was hard to believe that this room was meant for social parties when it was so dingy and dark. There were no windows to this room, only a large door leading to the back. This same door was also one of my only two ways out of the building should I need to leave or escape. When we first entered the building the owner wanted me to wait by the back door so he could check ahead for squatters. Apparently he and his girlfriend noticed a broken window the previous day and were not sure how long ago it had been broken. When they bought the school a year ago there was an issue of squatters and they wanted to check the area thoroughly before leaving me alone inside. I could appreciate that! The first floor was where the science rooms existed. There were lecture rooms that reminded me of modern college stadium style classrooms, but much smaller in scale; pipes and electrical outlets that would have been connected to chemistry tables. There was also a dark room with attached art room. The art room still had an easel and one of the doors had old set of earphones hanging on the knob. In the front and center area of the building existed the main stairway from the front entrance leading up to the second level. Walking up these stairs I could see the grind of thousands of previous footsteps on the edge of stone steps. The students were no longer around, but they left their mark. It was on the second level I found the principal’s office, library and study hall room and, most excitingly, the lower access into the school theatre. The theatre was my favorite room. I found myself walking back to it several times. There were a few rows of seats that dated back to the original 1922 seating and the rest were from the 1960’s. Some of the seats were missing, a couple of doors rested in the aisles and the light fixtures were damaged from previous destructive trespassers. A set of eerie gray curtains still hung as the stage backdrop and plenty of lovely light came in from the large windows. The theatre took up two floors, most of the back center of the building and was complete with loft seating from the third floor. The third floor was filled with simple classrooms with some old school chairs and the access into the theatre loft seating. I found plenty of graffiti left on the chalkboards from previous students. I think the owners were going to find a way to preserve those. The chalkboards were in great shape and it was amusing to read some of the written comments from former students. Surprisingly the damage found inside the school was minimal. There was some roof leakage in the front. The leak made the walls and floor weak, visible on both the third and second floor. In the back corner of the theatre room was another leak. Both the leaks were fixed by the current owner to prevent the damage from getting worse and areas affected will eventually be repaired. Beside the two small sections to be avoided for safety reasons I had no problems or limited access with the rest of the building. I spent about 4-5 hours inside; taking my time and returning to several interesting spots as the natural lighting outside changed. There was one point during my day when I stopped everything and sat in the doorway of one brightly painted room just to gaze down the empty hall; taking some time to reflect in my sketchbook on where I was and what I was finding. With the exception of the pigeons and muffled sounds from the outside world, it was rather quiet inside. I felt alone in my own little world and wanted to enjoy that moment before it was time to leave. I like to think that buildings like these have their own souls and will connect with a person, such as myself, in the same way that I often feel connected with them. I almost missed this little Nebraskan house. It lay sequestered across a small bit of distance and some active RR tracks. If it wasn’t for a brief and lucky moment, of me glancing to my right when the road was slightly elevated, I would have continued South into Sidney, oblivious to any personal loss. Fortunate for me I often experience these lucky moments! For a fleeting moment I had considered immediately pulling Simone, my beloved Escape, over onto the shoulder of the highway, parking, and sprinting across the tracks and grassy landscape toward what I have referred to ever since my visit as the “Little Sidney House”. Named for its close proximity to the nearby town of Sidney. Instead of parking on the highway, I managed to spot a place to safely cross the RR tracks, Pacific Union I think, and gain access to a dirt frontage road that would lead me straight to my desired destination. Pulling up onto a grassy path that was once the driveway, I immediately notice a discarded Christmas tree tangled with another tree and still decorated with its red ribbon. It was a depressing sight. It looked as though the holiday tree was ceremoniously tossed out the front door and forgotten about before the door had shut. I interpreted the Christmas Tree as an indication that the house was probably recently abandoned by its previous occupants, since it was early Spring. Inside, like so many other houses before, there existed a mess that gave me reason to suspect my earlier thoughts about when the house was abandoned may have been a bit off. There were chunks of the walls missing and scattered on the floor in pieces. Damage woodwork, and a destroyed bathroom and kitchen. In the kitchen the counter with sink was torn away from the wall and laying on its front side and the wall paper looked dated, possibly from the 1970’s. In the front of the house I saw evidence of a small fire that almost got out of control. I suspect the fire was from vandals visiting the house after the occupants abandoned it. There was no upstairs level, but there was a basement. I did not venture below because there was a dead animal at the foot of the stairs. The house was small and the floor plan was similar to what was commonly built in the 1920’s, give or take a few years. I know the area South of the house had been settled in the late 19th century and to the North a town was established in 1913. Based in this and some basic knowledge of housing styles, I think my estimate is fairly accurate. Out back I found a pile of rubbish with items that would make any collector of 80’s memorabila ecstactic, a Rambo thermos, a couple of those classic plastic lunch boxes that were so popular in the late 70’s and 80’s and an old plastic Polaroid camera. Its been almost a year since I had ventured into the Little Sidney House, and I hope to one day soon make a second visit. Just to see what has changed. I am curious to know if the Christmas tree still lies entangled in the front yard, or if another visitor found the Polaroid camera and decided to make off with it.